BEIJING -- Volkswagen Group plans to spend 10 billion euros ($11.8 billion) by 2025 to develop and manufacture all-electric and plug-in hybrid vehicles as it seeks to comply with upcoming stringent rules in China. VW intends to launch 15 of the so-called new energy vehicles (NEV) models over the next two to three years, and an additional 25 after 2025, China chief Jochem Heizmann told Reuters on Thursday. VW’s venture with Anhui Jianghuai Automobile Group will start production of electric vehicles in the first half of next year, while sales will start in the second half. China's NEV production and sales quotas, which must be met by 2019, have prompted a flurry of EV deals and new launches as automakers in China race to ensure they do not fall short. Automakers that do fall short will be required to buy credits. VW currently has around 10 NEVs already on the market in China, although all are imported models with limited sales volumes, according to a company spokeswoman. Volkswagen is looking to start building the electric Golf in China next year in a bid to meet quotas for electrified vehicles. Heizmann, speaking ahead of the Guangzhou auto show, added that the group is aiming to sell 400,000 new energy vehicles per year in China by 2020 and 1.5 million per year by 2025. Heizmann said some of those models will have a 400-600km (240-360 mile) driving range on a single full charge. By comparison, Tesla's Model S has a range of 490km and as much as 632km depending on battery capacity, according to the company. 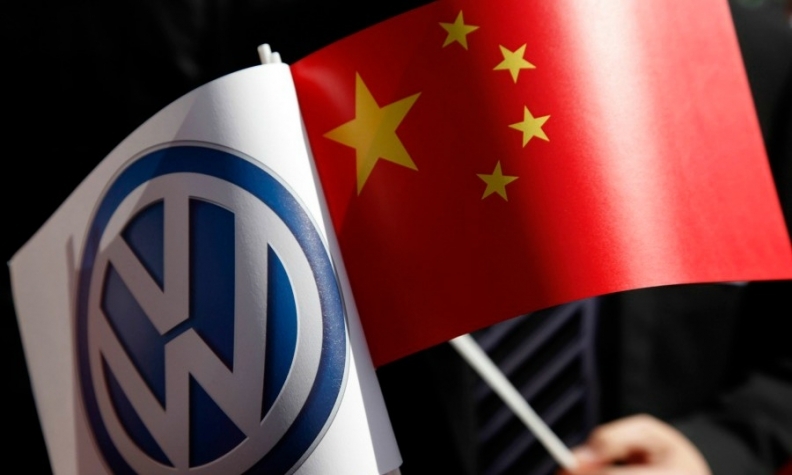 VW is also confident that its group companies and their local China joint venture partners will be able to generate enough NEV sales volume to account for NEV quotas by 2019, Heizmann said, adding that there will be no need to buy credits. "We need high volumes of new energy vehicles... we are working on full speed on that." Last week, General Motors's China chief Matt Tsien told reporters GM's China joint ventures will be able to generate enough NEV sales volume to account for NEV quotas by 2019 and without the need to buy credits. Tsien said both GM and its China joint-venture partners "are working to at least meet, if not exceed, those credit mandate requirements." The Guangzhou auto show starts on Friday.